Pink clouds at sunset linger above Nictau Lake in Mount Carleton Provincial Park in Restigouche, New Brunswick in Canada. 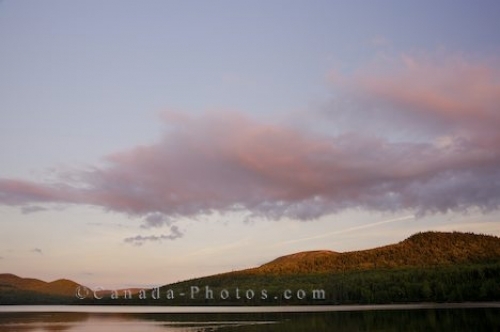 The glow from the sunset reflects off the hill tops that surround Nictau Lake in Mount Carleton Provincial Park in New Brunswick as the pink shaded clouds colour the sky. The lake appears untouched as the light glistens off the surface while darkness starts to settle in around the lakeshore and some of the wildlife in the area will come to life. Sunset over Nictau Lake in Mount Carleton Provincial Park, Appalachian Range Route, Highway 385, Restigouche, New Brunswick, Canada. Picture of a calming sunset above Nictau Lake in Mount Carleton Provincial Park in New Brunswick, Canada.